Brave New Jersey is a sweet little comedy. 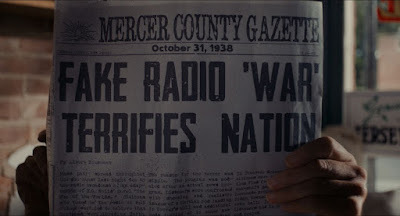 Set in the fictional town of Lullaby, located not far from Grover’s Mills, the landing site of the Martians in Orson Welles War of the World’s broadcast. After a brief set up period where we get to know the characters, the film shifts gears and throws us into the panic some people had when they heard Welles broadcast of Martian destruction. A low key gentle comedy full of laugh out loud moments Brave New Jersey is a sweet little film full of great characters dealing with a crazy situation. And I don’t know what else to say. That isn’t a knock against the film, rather it is simply that the film is just so sweet I don’t want to spoil it for you. I could go on about the set pieces and witty exchanges but I really don’t want to take away the joy you’ll get from discovering them for yourself. This is one of those small gentle gems that plays best the less you know. The joy of the film is finding your way through the “invasion” and being completely unaware of where it as going. I know that when I was watching the film I was glad that I didn’t have any idea where it was going or who anyone was.